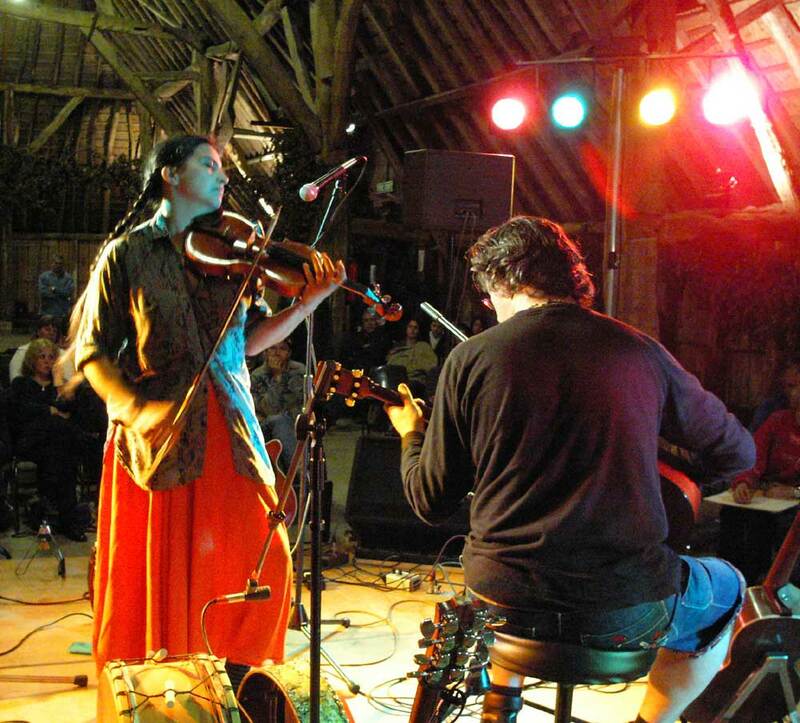 Kent Folk Photo Reports: Fiddlers Various. 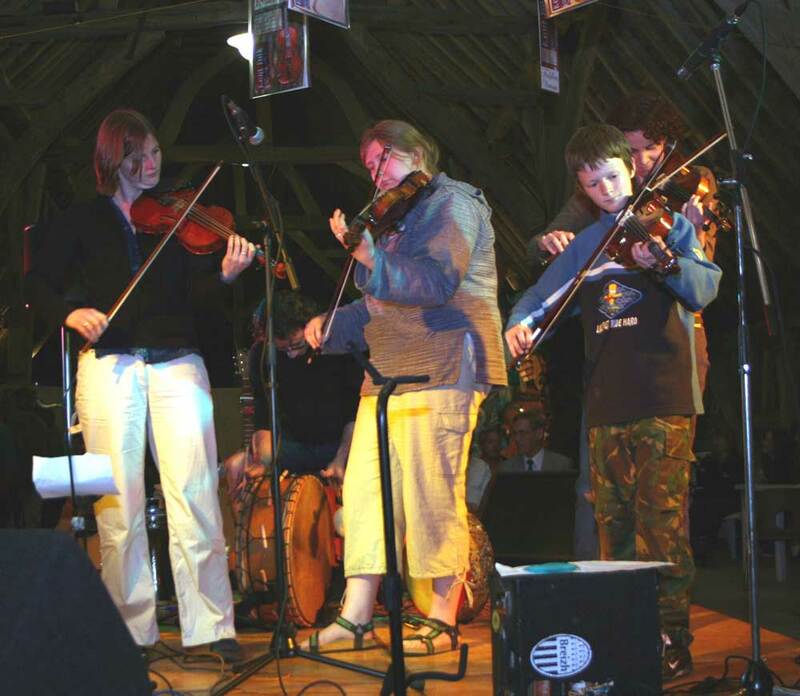 "Fiddlers Various" took place over the weekend of 3rd to 6th June, 2005. 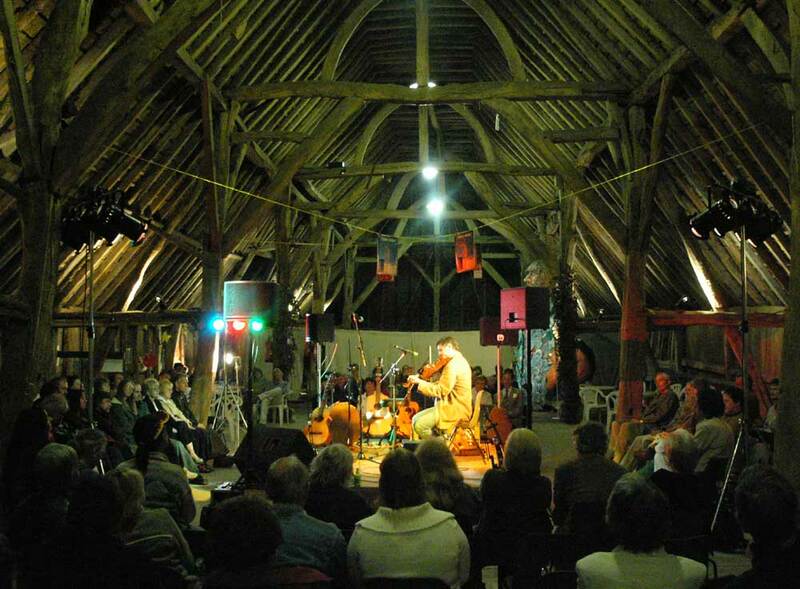 This is the first of what is hoped to be an annual series of fiddle events in and near the atmospheric Littlebourne Thatched Barn, near Canterbury, Kent, CT3 1TU. 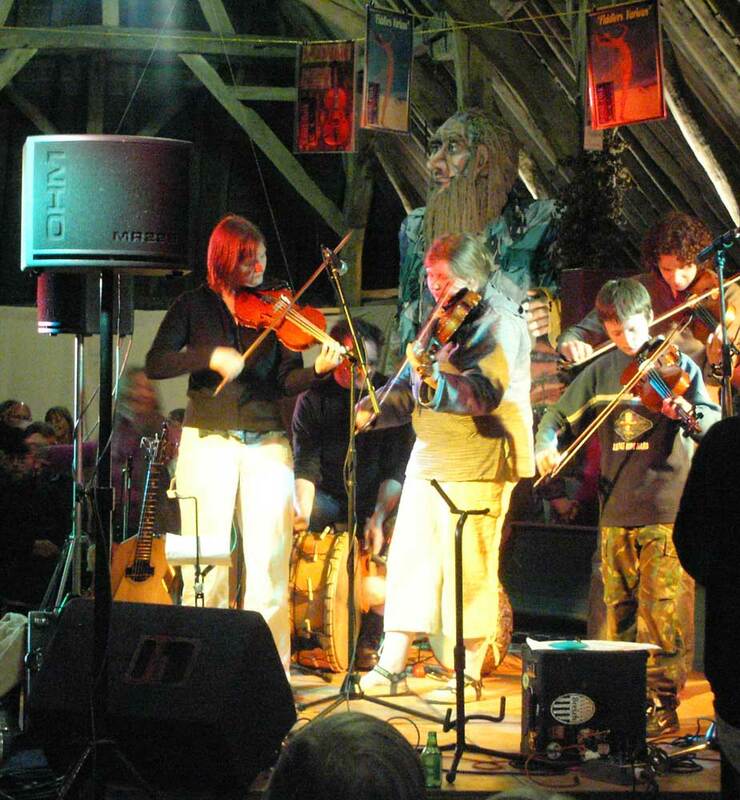 Featuring seven fiddlers, mainly from Kent - some brought back to the county just for the event - the Fiddlers Various long-weekend has proved to be an excellent success. Organised by Dr. Beau Webber, who has now run the KentFolk.com website for five years, and is also a member of the Littlebourne Thatched Barn committee, this was the first time such an ambitious event joining both these passions has been attempted. 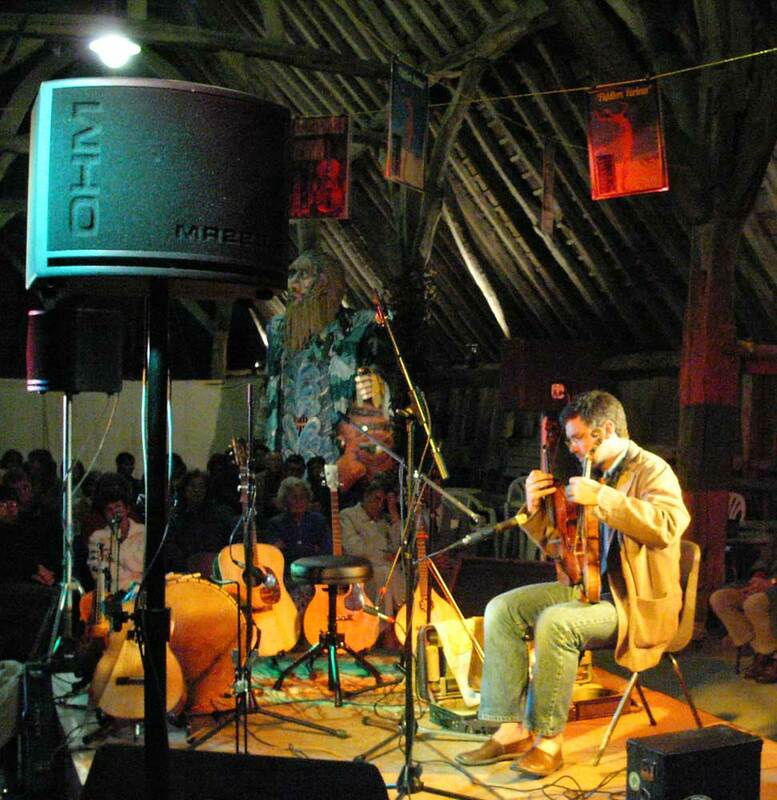 To date, live-music enthusiast Beau Webber has mainly just listed and reported on the Kentish gigs (traditional music, jazz, blues...) that others have arranged, so that all in Kent can know about them and go listen. 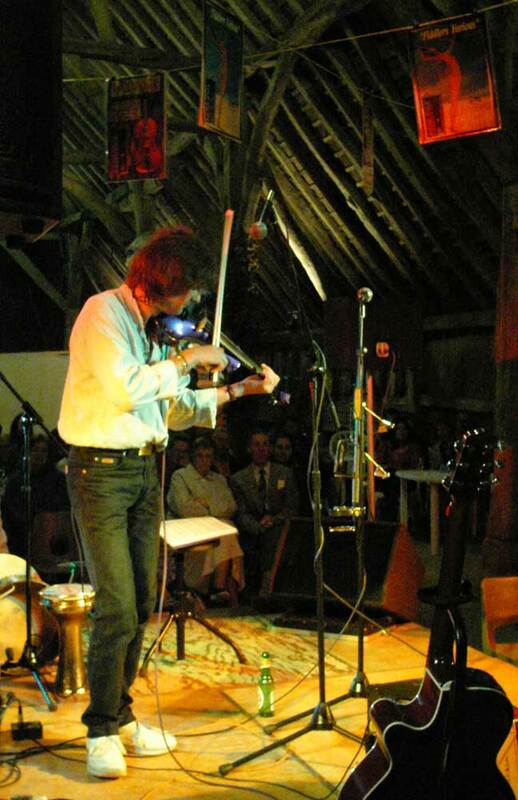 This time he has created an event dear to his heart, with some of Kent’s best fiddlers, in the wonderful Littlebourne Thatched Barn, with lighting and quality sound to do them justice, and with space for all those who wished to come. 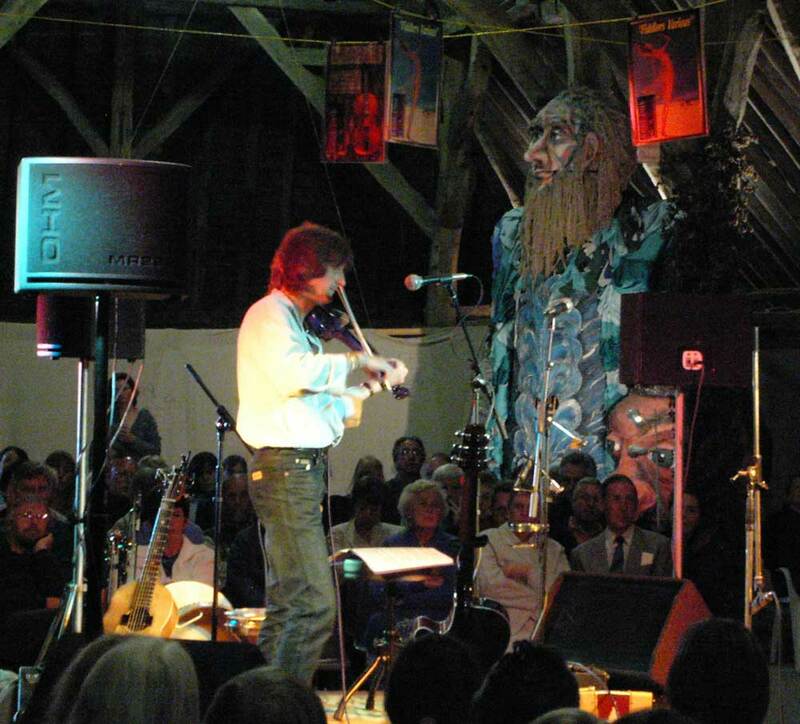 The event was staged "in the round" with the audience seated on the sides of a central stage, so that all could see well and hear the details of this wonderful fiddle music. KIF 7062 Ramona-Egle Chris-Saddler - A wide-angle shot of the interior of the barn. 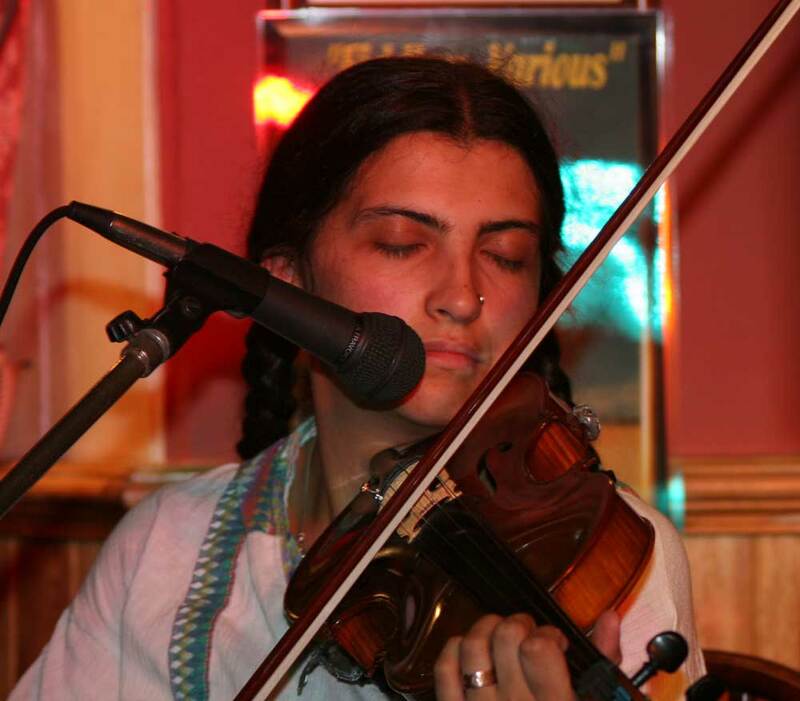 The aim was to present in one evening as varied a selection of fiddle music as possible, with fiddle genres from all round the world. 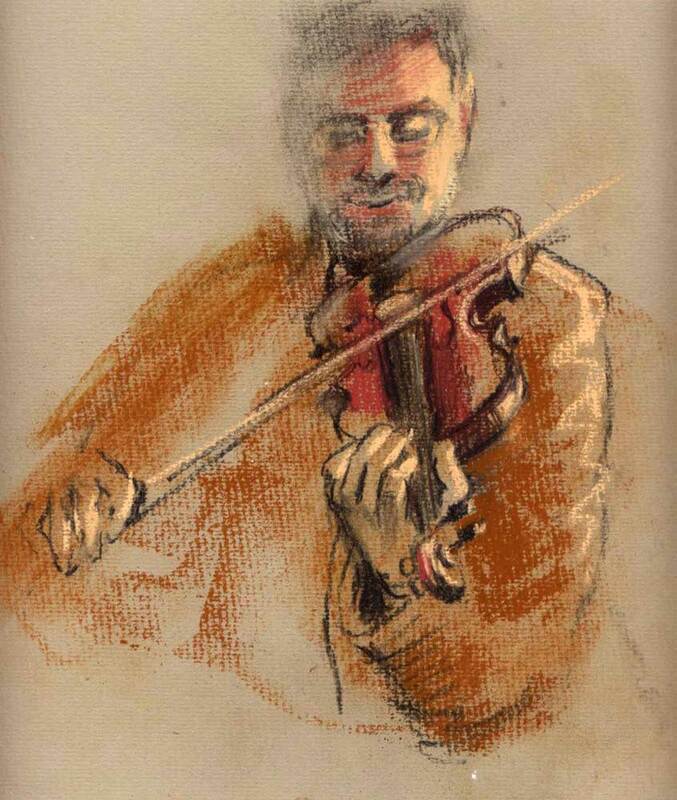 Where possible the fiddlers were Kentish (born in Kent, or currently fiddling in Kent). An exception was made for frequent visitor Ben Paley, from Sussex. 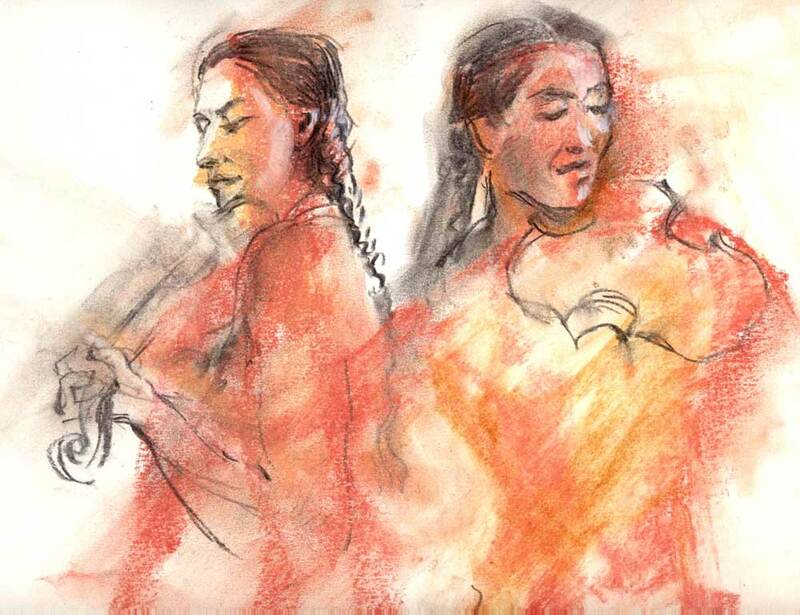 The energy of the event was captured by Kentish artist Sarah Steen; her on-the-spot sketches are shown below, interspersed between the photographs. Saskia Tomkins, King William IV, Littlebourne. 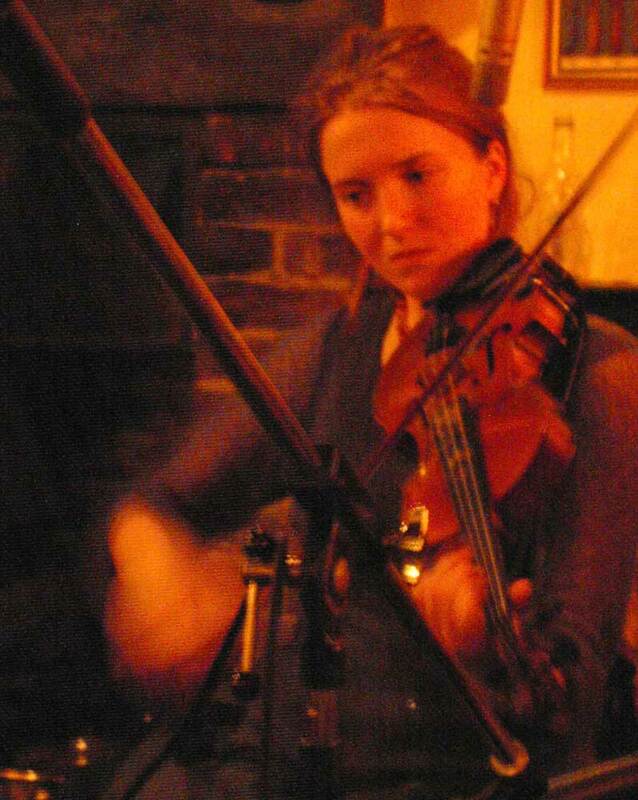 The long-weekend started on the evening of Friday 3rd June 2005, with the exquisite fiddler Saskia Tomkins and all British uillean pipe champion and virtuoso bodhran player Steáfán Hannigan, in the Littlebourne pub the King William IV, Littlebourne, CT3 1UN. 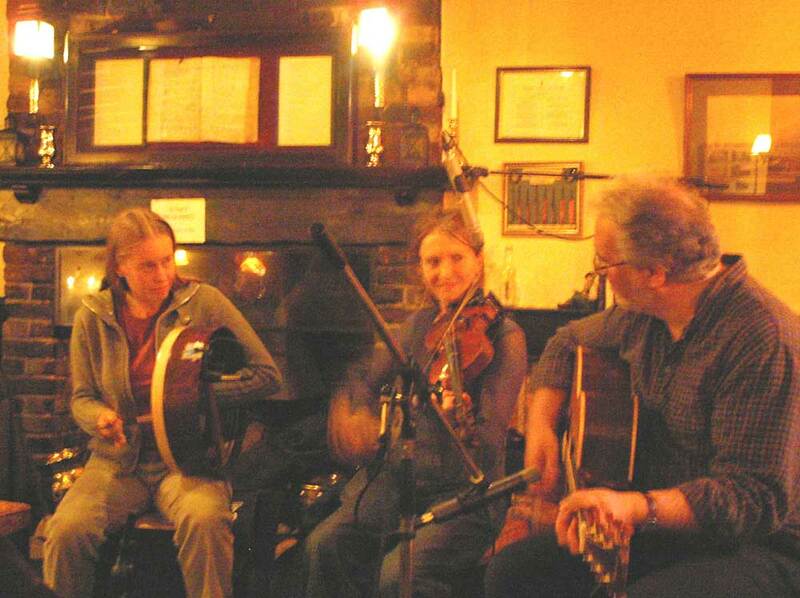 Packed to a comfortable capacity by both traditional music enthusiasts and the pub regulars, it was a real musical treat enjoyed by all. 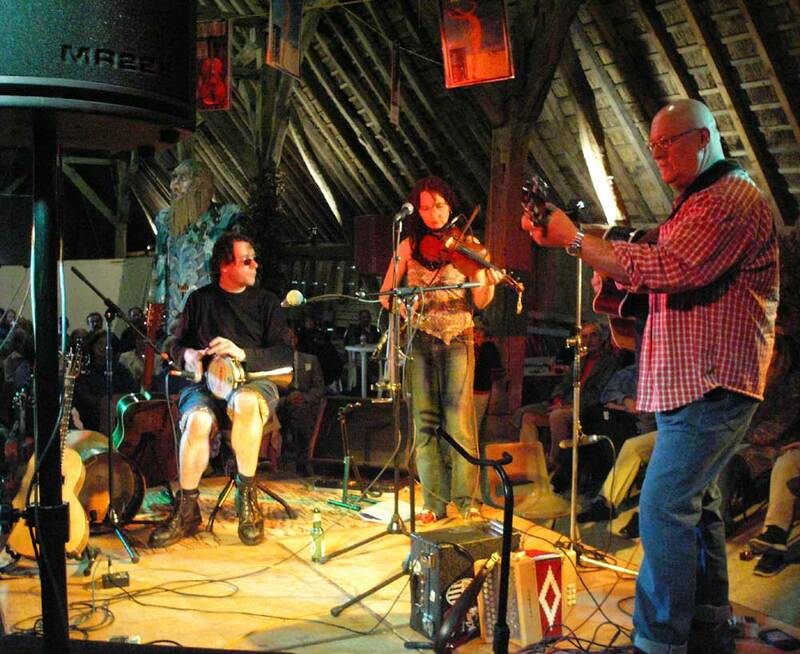 The regulars were suitably amazed by the occasional spontaneous Cajun waltz and Appalachian clog. 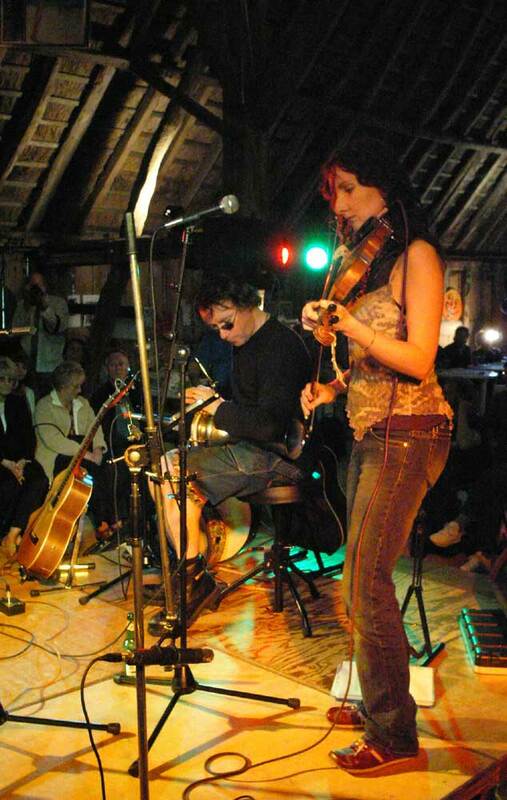 Fiddle Workshop, Thatched Barn, Littlebourne. 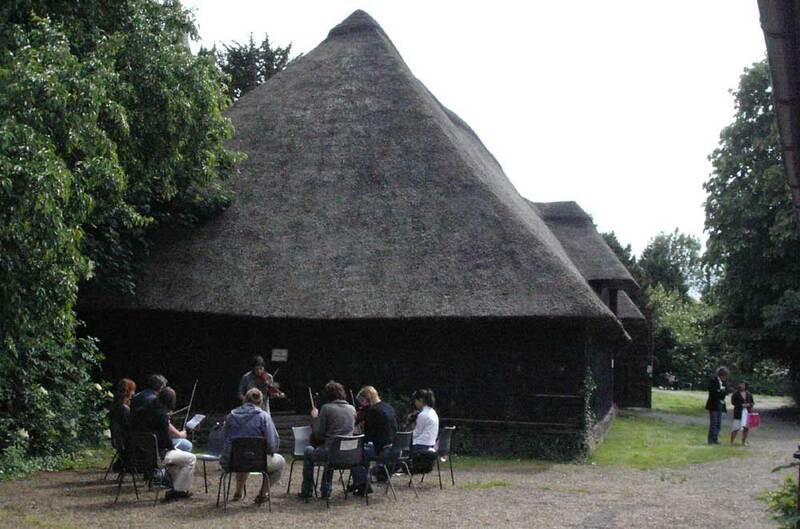 Sunday morning started with a fiddle workshop in Littlebourne Thatched Barn, (CT3 1TU), led by Ben Paley - somewhat disturbed by the church bells (even though the church was closed for repairs). 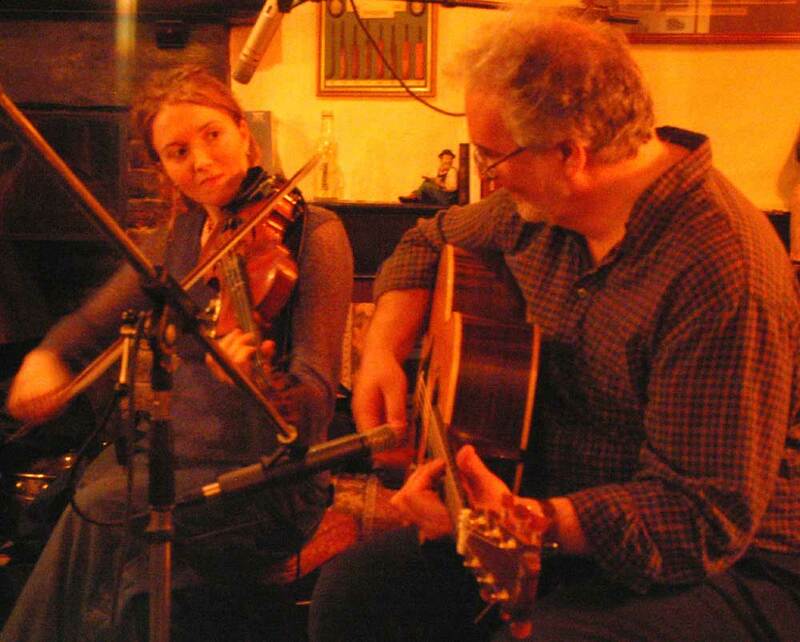 After a lunch in the Anchor Inn there was another fiddle workshop, led by Saskia Tomkins. Saskia took her group out of the barn into the gentle afternoon sunshine. In the workshop Ben’s students worked on : Flop-Eared Mule and Rock the Cradle, and Saskia's, an A major Macedonian tune in 7/8, and an A minor Bulgarian Kopanitsa in 11/16. Later during the evening concert Saskia’s group performed a short set. 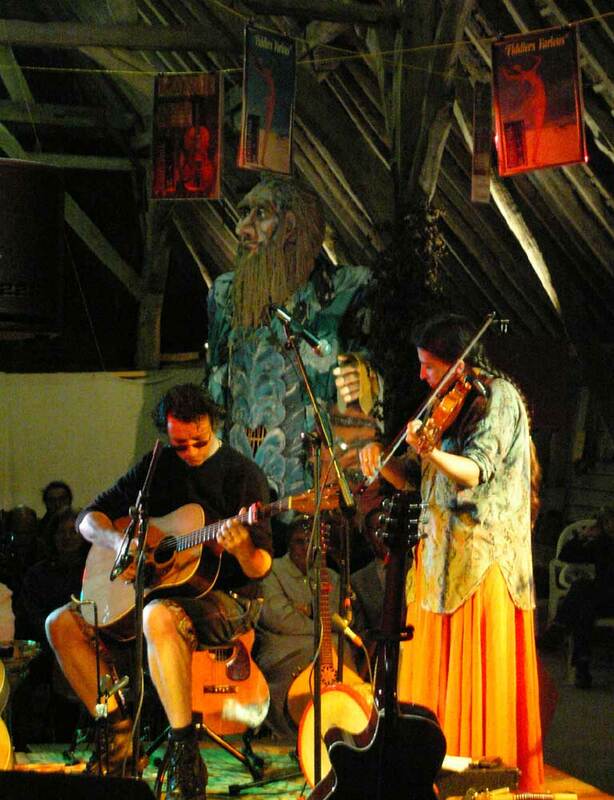 The Littlebourne Giants, Torrent, Ebb and Flow, can be seen presiding over the occasion, as in many of the other photos. Workshop students joined all the other players for the finale. 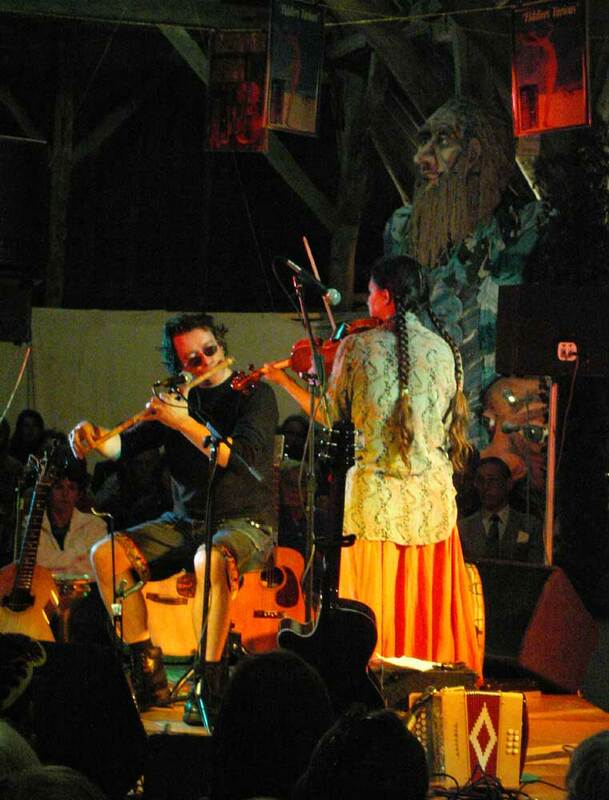 Yves Langlois (fiddle) and Chris Taylor (guitar, accordion, harmonica) - Wild Turkey. Wild Turkey kicked off with a two-step 1. Le Blues de Port Arthur, and then followed with : 2. Waltz in D minor, 3. La Porte en arriere - The Back Door (D.L. Menard), 4). La Grosse Erreur - The Big Mistake (I. LeJeune), 5. Zydeco Hee Haw (Boozoo Chavis). 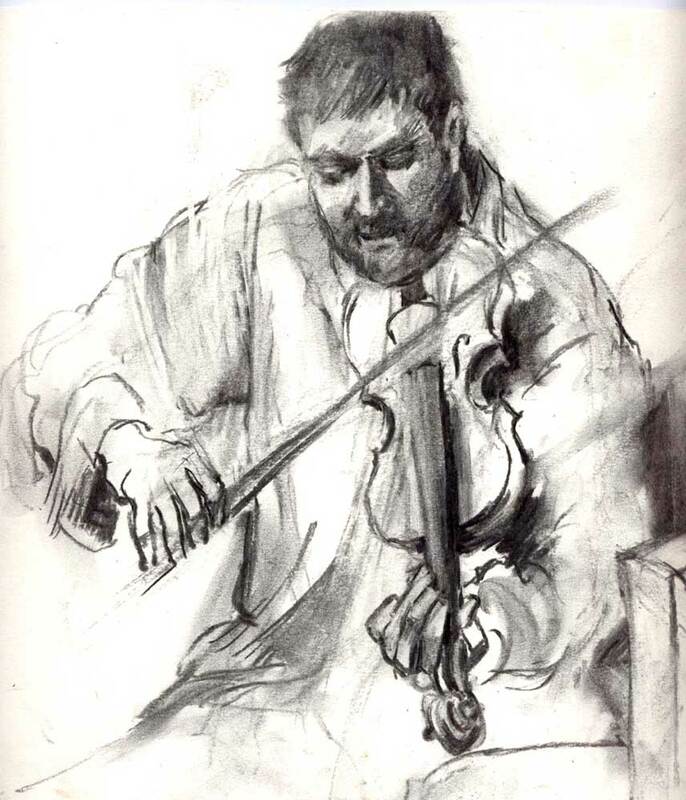 Sarah Steen captures Yves Langlois. 1. Hut on Staffin Island (John Cunningham) / Woman I Never Forgot (Sean Ryan), 2. 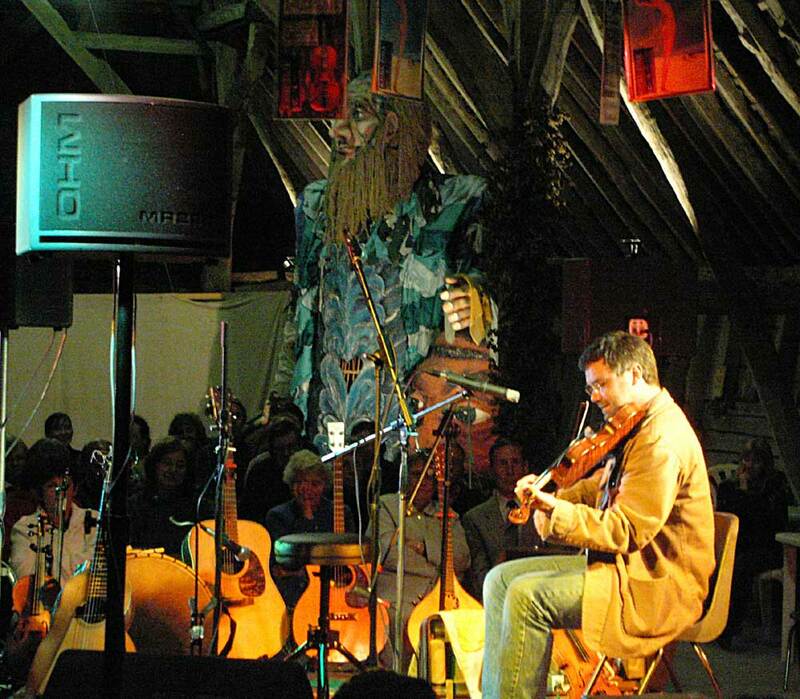 Flatworld (Andy Cutting) / Breton An Dros, 3. Cinnamon and Caramel (Suzanne Vegas) / Tamarind (Ramona Egle), 4. Penknife Killer (Trad. Swedish), 5. Gankino Horo (Bulgarian). Sarah Steen captures Ramona Egle. 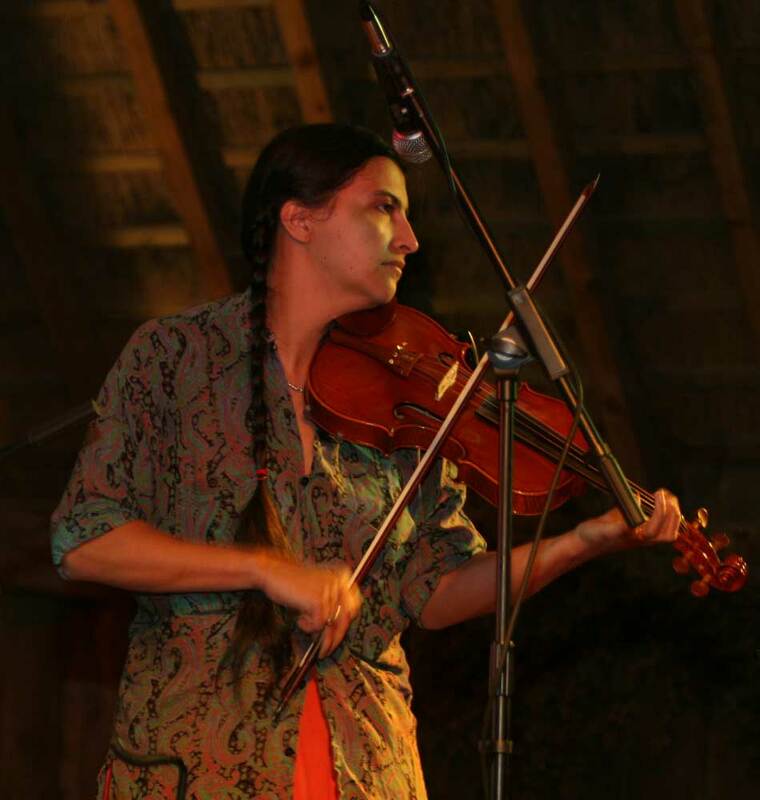 Ben Paley joined Ramona Egle for the most interesting Swedish fiddle tune : 1. 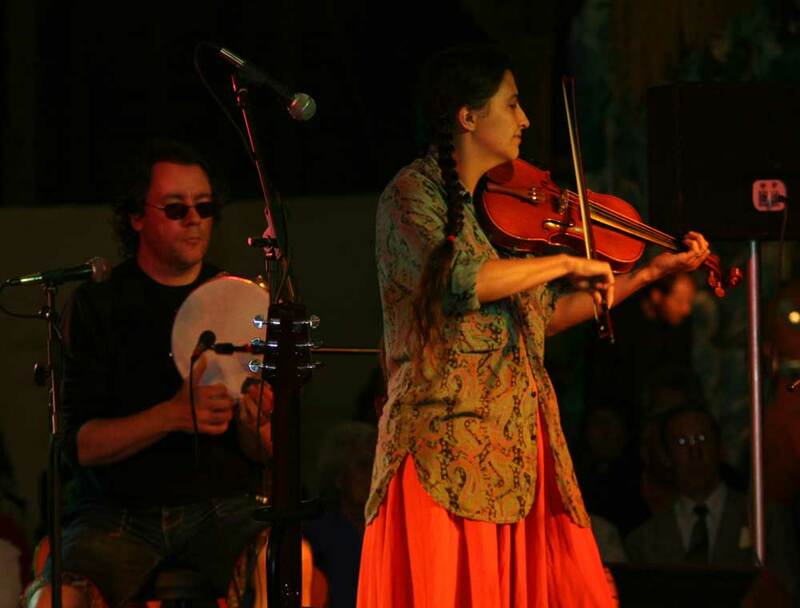 Vallpigan, and then launched into an excellent and varied set of European, Celtic and American music with great concentration, precision and focus: 2. Rock the Cradle / Rabger's Hornpipe (a version of Flop-Eared Mule), 3. Polska after Karl Lindblad, 4. Johnson Boys (as an instrumental), 5. The Beauty Spot / Farewell to Connaught / The Tempest, 6. Sales Tax Toddle, 7. A Youth Inclined to Ramble. Local hero Ian Cutler brought the first half to an end with a rousing flourish, playing a range of interesting pieces including two fine Morris tunes - Tool Setting / Shooting, three rant tunes including The Morpeth rant, a Breton tune Dance de ride, Andy Rennicks Ferret (Scottish written by Gordon Duncan), Banks of the Suir, King of the Fairies / The Fairy Dance, a Hungarian tune - Macedon Express, finishing with Bonny Kate / The Teetotaler - I think his fans even forgave him for not including his renowned "Orange Blossom Special" ! 1. Hungarian style hora (Saskia says: "Made up by me on the spot - wot a cheat", Beau and others say: "breathtaking"), 2. 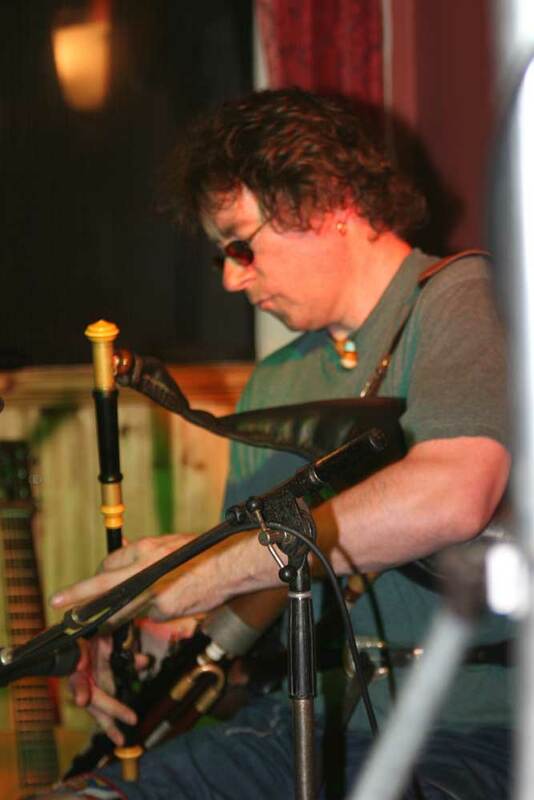 Your Karma Ran Over My Dogma / The Blackberry Blossom (Steáfán Hannigan / Trad), 3. Sun Polska / Macedonian tune(trad maybe / trad), 4. 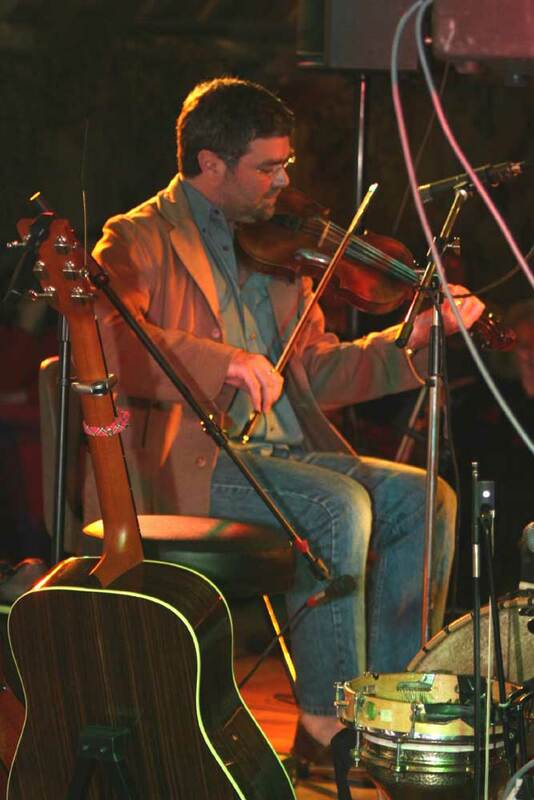 Spikes Lane (Steáfán Hannigan), 5. three Reels, ? / ? 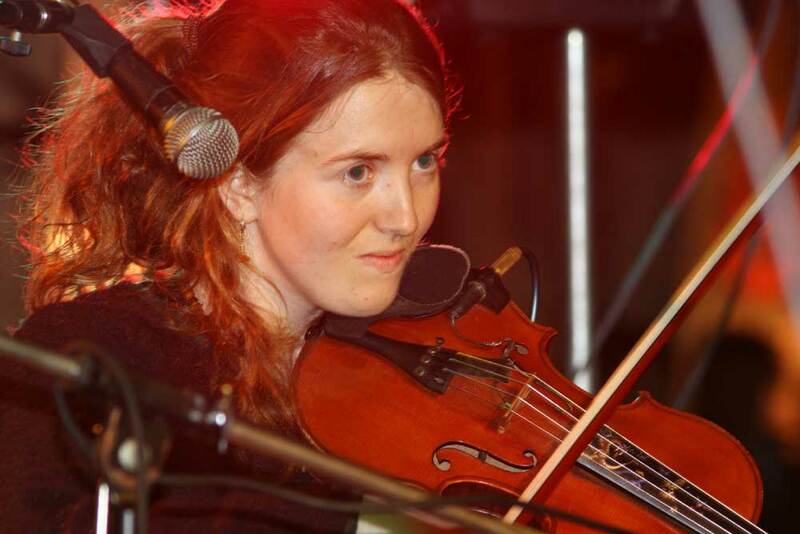 (Liz Dougherty) / Concert Reel (Trad). Again and again I here praise for this set. Sarah Steen captures Saskia Tomkins. Some of the people who attended Saskia Tomkins’ fiddle workshop then played the first of the tunes they had studied, the complex Macedonian A major piece, with its tricky 7/8 timing. 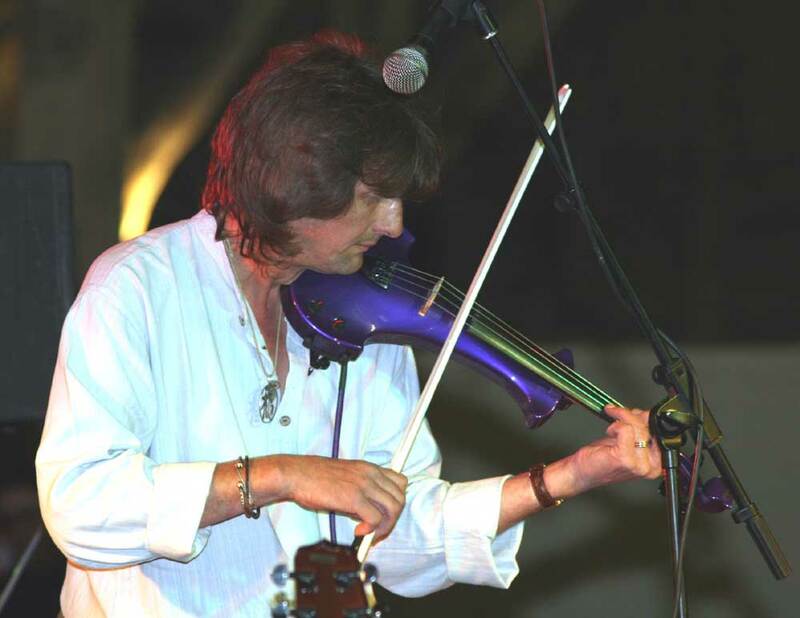 Chris Wood - founder member of the highly respected English Acoustic Collective - fully justified the quote I had found, as "among England’s finest interpreters of traditional music", by demonstrating in a spell-binding performance of fiddle tunes with sung accompaniment that he truly is a master of the fiddle. Chris’s first pair of songs were Easter ones : 1. Pace Egging, 2. Reveille – Wake Up!, and he then continued with 3. Our Captain Calls All Hands, 4. Sweet Jane, 5. As Pants the Hart. 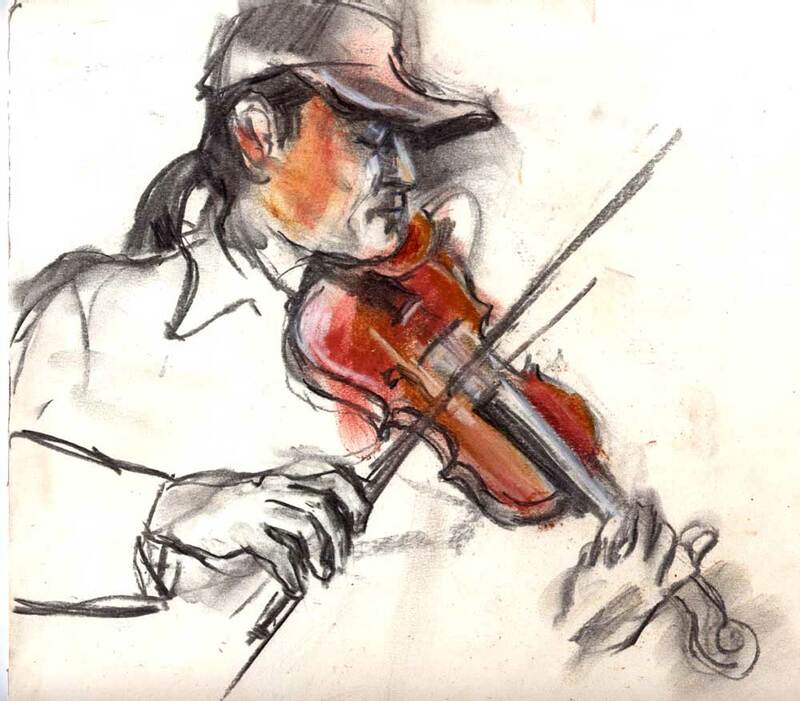 Chris made use of a child’s viola - the rich tones fully complemented his voice, as more than one member of the audience later commented to me. 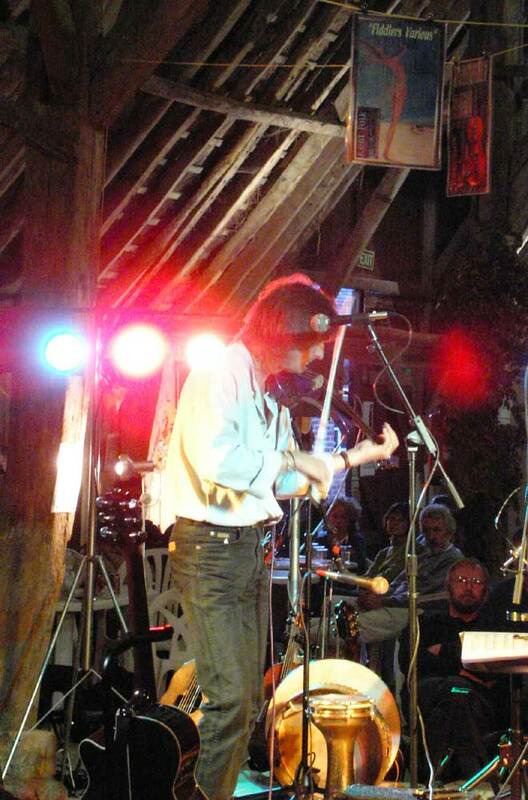 He also sung and played one piece pizzicato on twin fiddles, an item that I had particularly asked for. 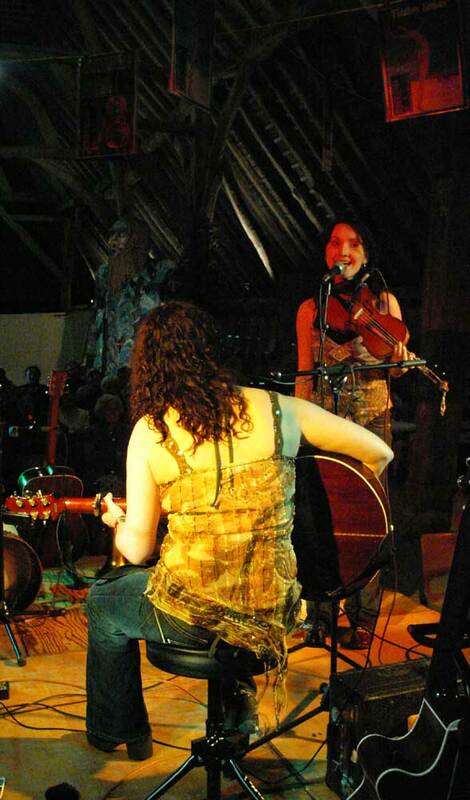 The intensity of this huge barn all focused onto the tightly controlled phrases of fiddle and song was quite remarkable. 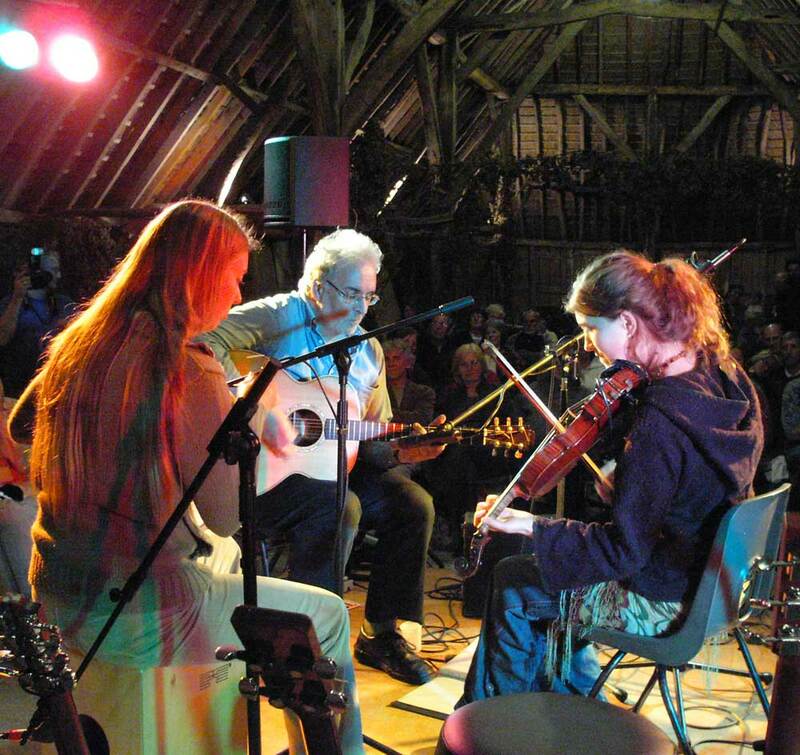 Laura Targett (fiddle), Lucy Randall (bodhran) and Pete Gazey (guitar) - Monkey Puzzle - were the final act of the evening - at the quite correct suggestion of Chris Wood - and an excellent end to the evening they made, with a tight set full of bounce and life. Sarah Steen captures Laura Targett. 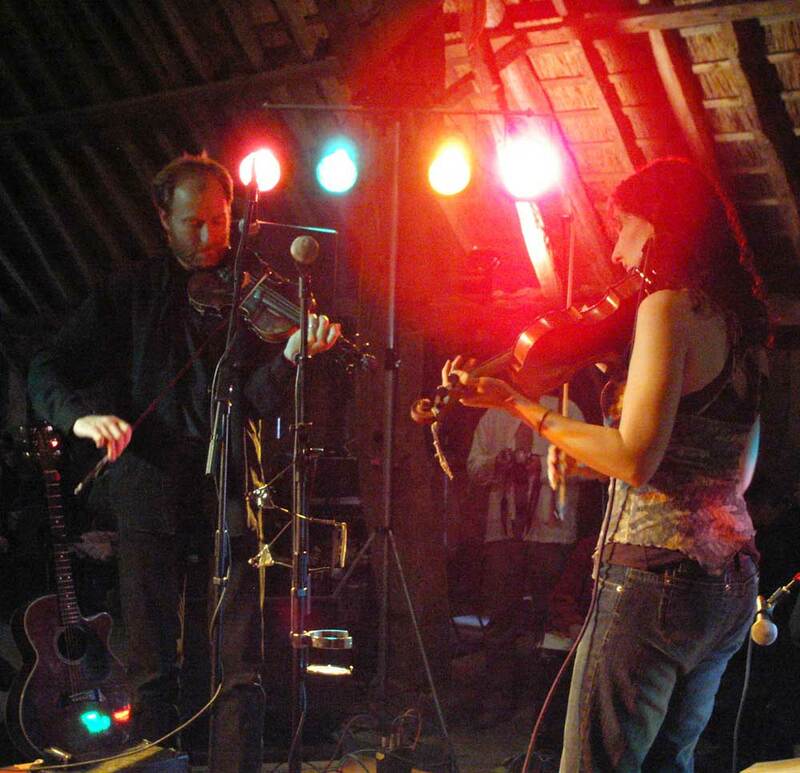 The evening concluded with a far too short finale with all the fiddlers (including the workshop ones) joining Monkey Puzzle on and around the stage, before having to close for a prompt end at 11pm. 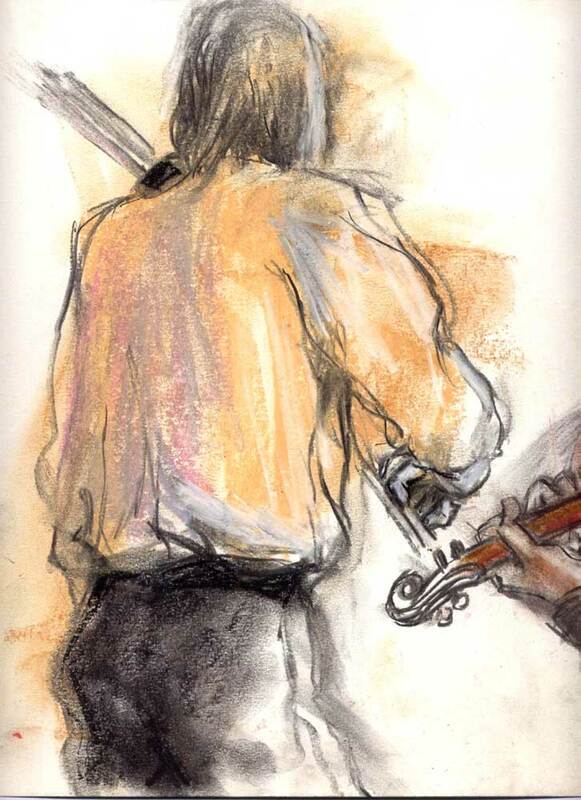 A memorable evening from all the players, my thanks to them, and repeated comment from the audience as to what an excellent evening it had been - particularly regarding the delight of having such a wide range of genres in one evening - which after all, was the original aim. 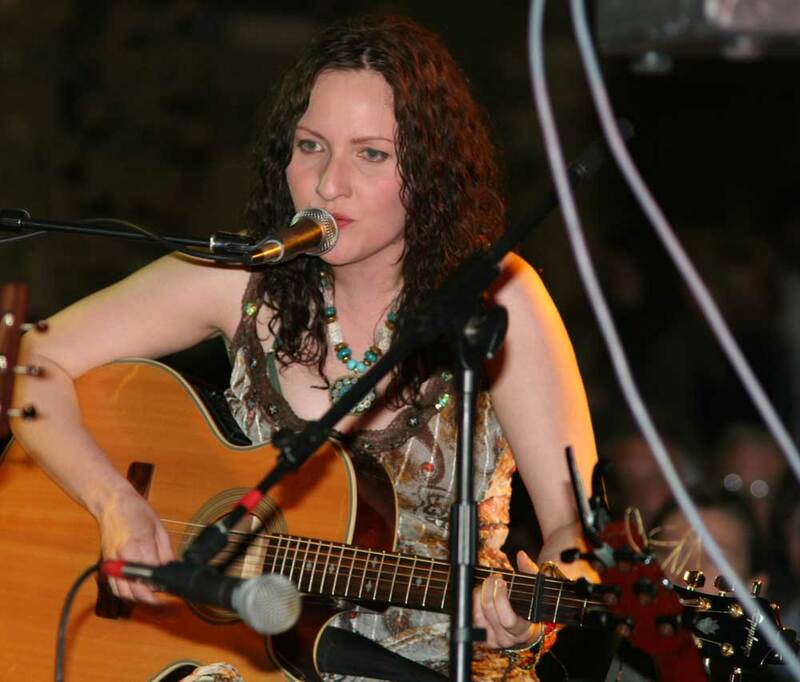 Laura Targett - (Monkey Puzzle), Red Lion, Wingham. 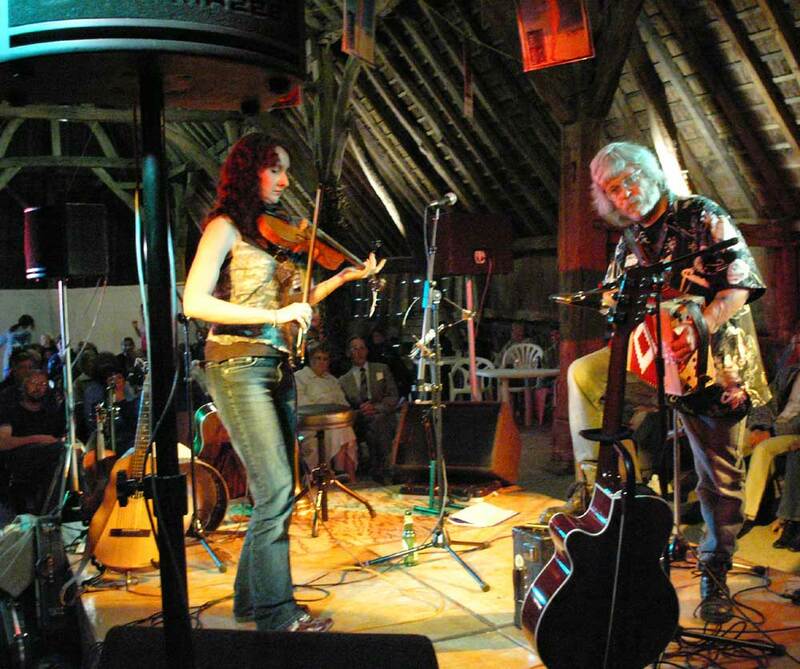 The long weekend ended on Monday with Monkey Puzzle - Laura Targett (fiddle), Lucy Randall (bodhran) and Pete Gazey (guitar) playing in the Red Lion, Wingham, CT3 1BB. They lived dangerously, and built two exciting but tight sets. The early evening was made slightly bizarre by the arrival of an ITV/Granada "music vs. food" pilot-programme filming crew and dual presenters, but it was a great evening not-withstanding. 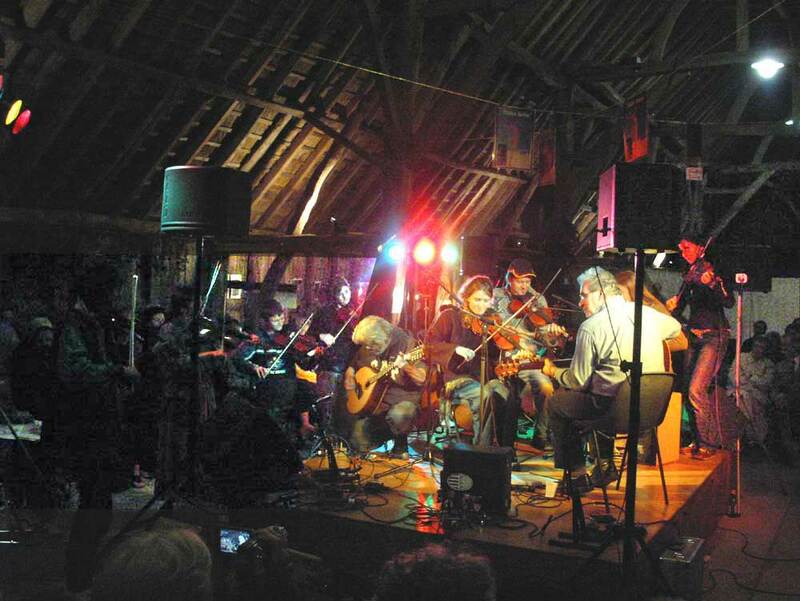 The aim of the long weekend and of the evening in the barn had been to provide a showcase of as wide a range of fiddle styles as possible, played by excellent players of each genre. 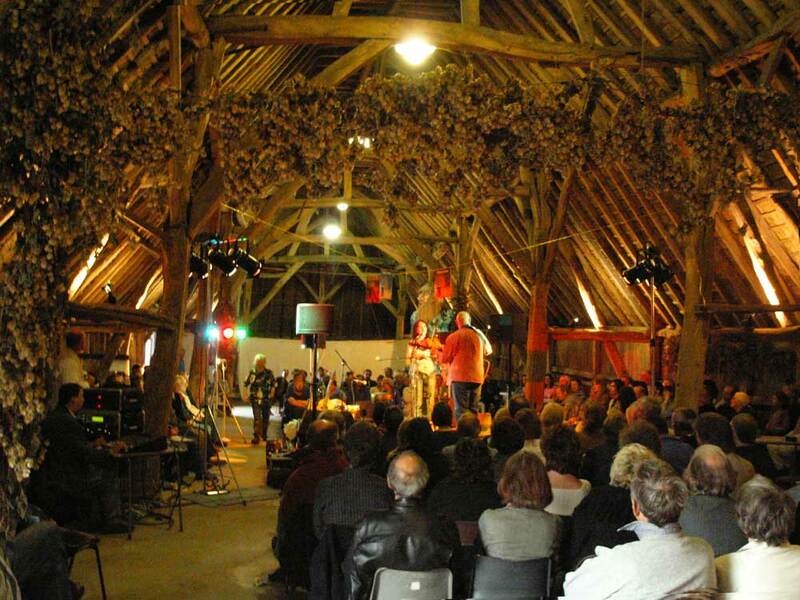 The repeated comments from the audiences at the end of each evening indicated that this had indeed been achieved most convincingly, and that a successful format now existed, such that there is every hope of repeating this "Fiddlers Various" event in the Littlebourne Barn and adjoining villages another year. 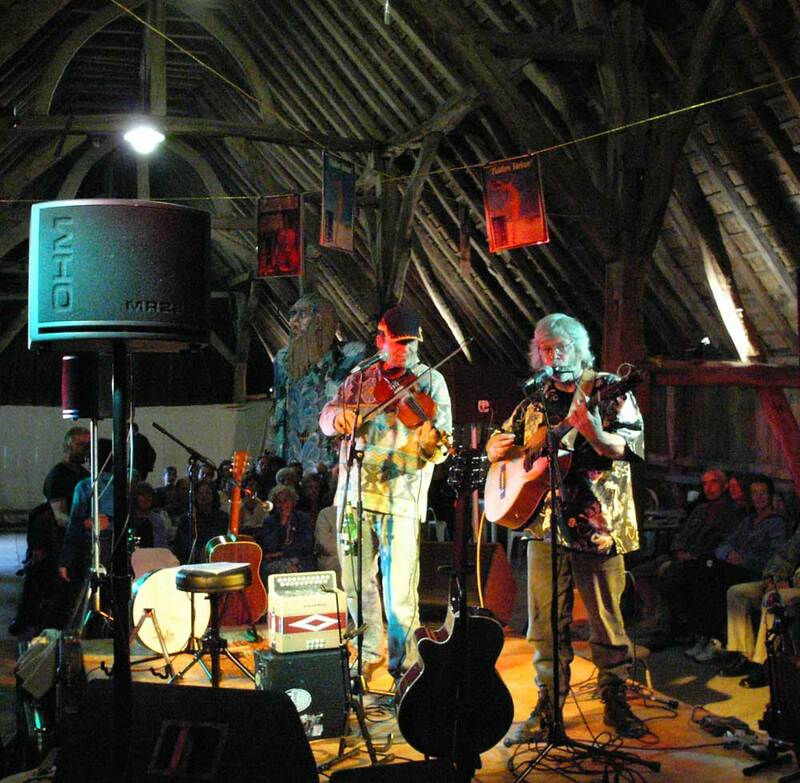 Thanks to Alan Greenwood for the transparent sound, and to Trevor Stephenson and Ramona Egle for the loan of their lighting gear, to Littlebourne Primary school for the loan of more chairs and staging, to Greg and Joe Robbins for digital still photography and video recording. All photos : IMG_XXXX © Greg Robbins, 2005. All photos : KIF_XXXX, text and logos © Dr. 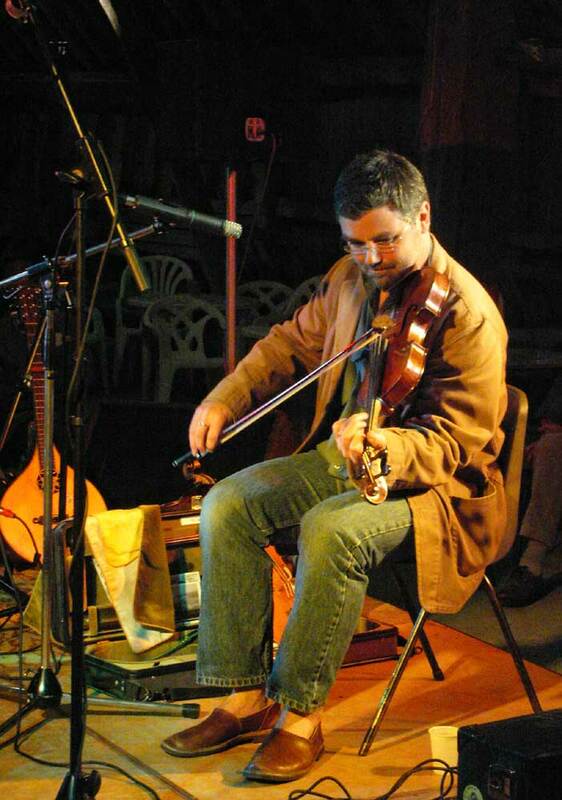 Beau Webber, 2005. 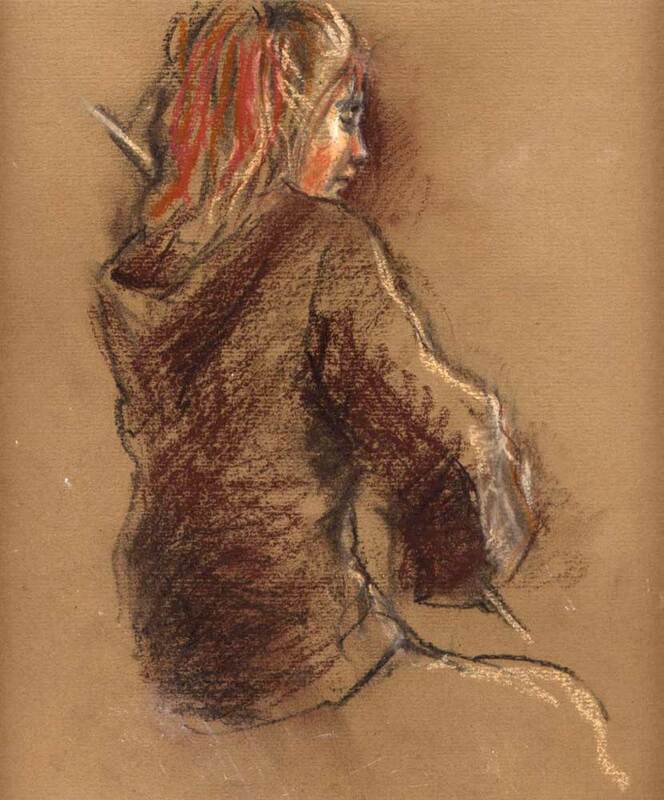 All drawings : © Kentish artist Sarah Steen 2005. Much sound and video editing still to be done, but where the musicians give their permission, it is hoped to produce an audio-visual record of this event.